This entry was posted in Magazine Translations on 03/15/2019 by BClarkOMP. Store Manager M - The 6th store manager for the Hey arcade. They've been making great efforts to spread word of Hey since taking over, sending out information and exclusive goods that are for sale their via social media. Store Employee S - A senior staff member that has been around since the arcade opened, who is in charge of the maintenance of various games. Their skills are indispensable to the continued functioning of retro games. 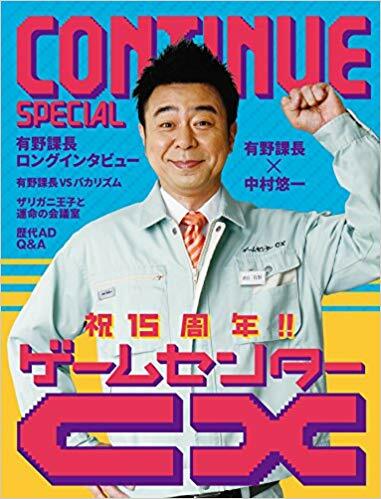 This entry was posted in Magazine Translations and tagged Continue, Game Center CX, GCCX, Kacho, Shinya Arino on 03/07/2019 by BClarkOMP. Interview - Kiyoshi Tane Photography - Hiroyuki Matsuzaki Shinya Arino was born in Osaka on 02/25/1972. In 1990 he formed a comedy duo called Yoiko with Masaru Hamaguchi, a friend since middle school. In addition to his activities as a part of said comedy duo, he also regularly appears on Game Center CX (aired on CS Fuji TV One), as well as a wide variety of other things. The Kacho's Skills Have Actually Improved?